How did they take photos of Jupiter - I mean Jupiter is illuminated and that's a lot of light to produce. Am I missing something, and there was some sort of dark photo technology used, or was there simply enough light from Sun to begin with? Or is this photo a fake? You can see Jupiter in the night sky with your naked eyes due to its reflected sunlight (although I believe that in July and August of 2014 Jupiter is very close to the Sun in the sky and is visible only for a little while near twilight). You can take a picture of Jupiter in the sky with any old camera. If you want a high-quality picture, your camera needs to have a lens arrangement that will make the image of Jupiter on the camera's CCD larger than the image of Jupiter on your retina. The thing to look for is a lens with a long focal length. If the focal length of the lens1 is long enough, it will need to stand some distance away from the camera's CCD on a rigid mount; this is usually called a telescope. You can replace the camera with your eye and see Jupiter's cloud bands directly. 1Actually most telescopes use a curved mirror rather than a lens, for several technical reasons. This was just going to be a comment, but it got too long. Technically the picture is a fake. It's actually a composite image of what we would see with our eyes (visible light) blended with light seen in 3 different filters (see this NASA article on the different filters on-board Cassini, the probe that took the images). The light that shines on Jupiter is of course the Sun's. It is indeed fainter than on Earth, by a factor of about 25, but that is still plenty. Using appropriate cameras, and long enough exposures, one can photograph much fainter targets. You can also note that there is a moon transiting in that picture, and its shadow is clearly visible. This should help you understand that the light source that's creating that shadow must be very far away. The only thing that could possibly do that is the Sun. You are correct: Jupiter is rather dim photography-wise. We can't use flash photography, as Jupiter is way too big for that to make any sense (even from a probe), so all the light in this image is indeed from the Sun, or from photo enhancement applied to the image after it was recorded (in which case it's still originally from the Sun). There are ways to take images of faintly lit objects with cameras that work: we can use digital equipment that is highly light-sensitive, or use longer exposure times to pull in more light. Some of the approaches get quite complicated if we need to block out any light from behind the object (this doesn't matter for Jupiter, but for extrasolar objects like exoplanets it can be a huge obstacle). We've taken images like this remotely from the Hubble, and close-up from probes. It's harder to do this remotely, for obvious reasons. Not the answer you're looking for? Browse other questions tagged optics astronomy jupiter astrophotography or ask your own question. Is the black hole image in false color? 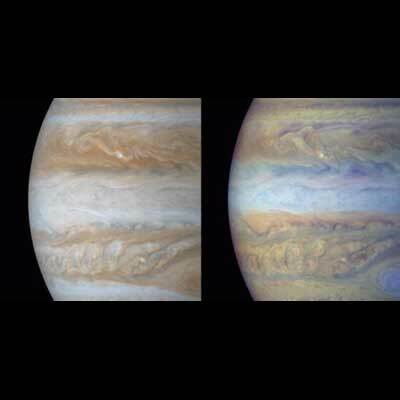 Why do gas giants have similarly coloured stripes? 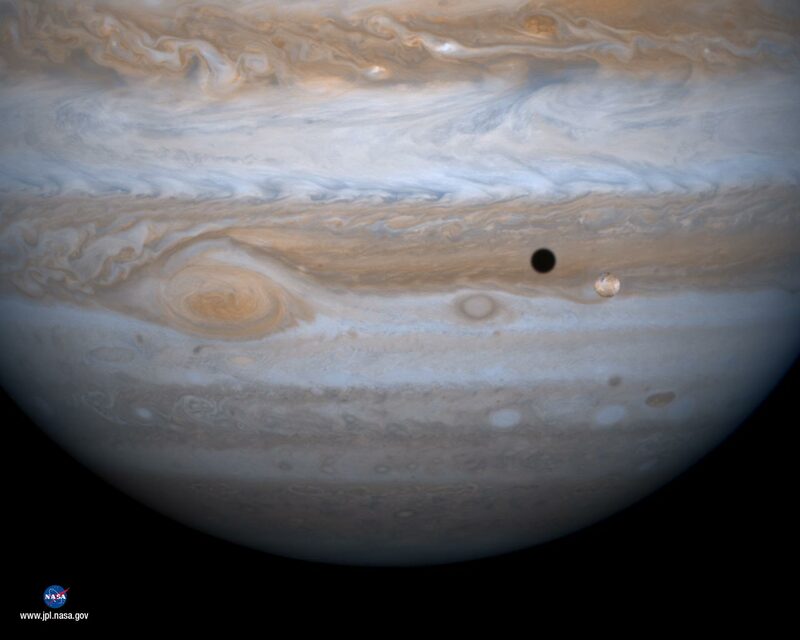 Was Jupiter's mass “guessed at” by Kepler or Galileo? Alma correlator for visible light and for space based telescopes? How can we see objects that are so far away? Actual Jupiter seen from the place, will it looks like on the pictures? If not the conjunction moon, then what?